This little guy must be a baby or teenager - the ones we normally see here are larger. 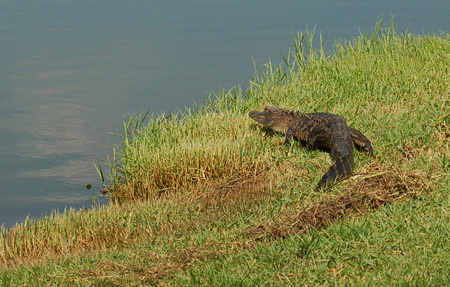 We take nightly golf cart rides here at the beach house and usually see 10 or 15 gators per ride! That's a lot of gators to see! In all the years we have lived here I've only seen two gators in our lake. They were both VERY small. We certainly don't get those over here lol...great photo. This page contains a single entry from the blog posted on July 3, 2009 3:15 PM. The previous post in this blog was When was the National Championship game?. The next post in this blog is With two hours to spare.